de Havilland D.H.9 E88?? which, according to Mr Clarke's caption, “came back to its own hangar - but through the roof". It was probably from batch of 200 serialled E8857-9056, built by the Aircraft Manufacturing Co Ltd at Hendon, and powered by the 230 h.p. B.H.P. six-cylinder in-line engine. SPAD S.7 scout A8832, bearing the white diamond of a training squadron aft of its fuselage roundel, was built by the Air Navigation Co Ltd at Addlestone, Surrey. The type was originally ordered for the Royal Naval Air Service, but all of their SPADs were eventually diverted to the RFC. Powerplant was a 140 h.p. Hispano-Suiza. 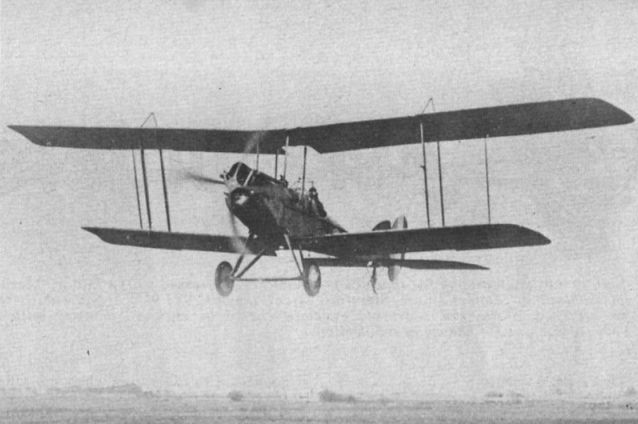 A Royal Aircraft Factory B.E.2e takes off. Usually powered by the 90 h.p. 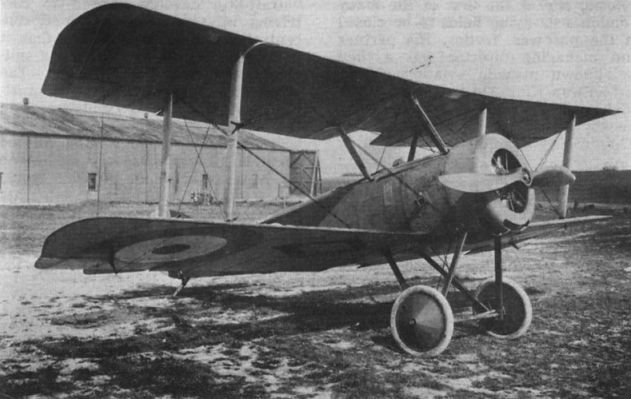 RAF la, the B.E.2e was a single-bay development of the B.E.2c and d reconnaissance biplanes, distinguished by the large overhang of the upper wing extensions. Also introduced on the B.E.2e was the larger fin with a rounded leading edge, subsequently adopted as standard on all B.E. variants. More B.E.2es were built than any other B.E. type, but its performance was not much better than the earlier machines, and the observer was still positioned in the front cockpit. The type entered RFC service in mid-1916. Leonard Clarke passes a hand-held camera to the observer of Armstrong Whitworth F.K.8 B3312, from same production batch as B3306. A fixed Williamson L type aerial camera is already attached to the fuselage by the pilot's cockpit, aimed down through the wing root cutaway. The complex undercarriage fitted here was later replaced by a simpler vee-strut unit. Mr Clarke poses with his aerial camera in front of Armstrong Whitworth F.K.8 B3306. 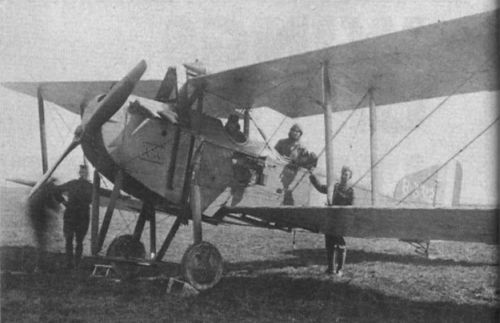 The F.K.8, along with the R.E.8, was the B.E.2e’s successor, and is seen here with the original inefficient radiators which ran up the fuselage sides and met in front of the top centre section. These were later replaced by more compact elements on fuselage sides alone. Also visible in this view is the camera access hole in the fuselage by the pilot's cockpit. Although regulations concerning aircraft markings were strictly observed at the front, officers and instructors at home-based RFC training squadrons often adorned their personal mounts in garish schemes, of which the Bristol F2B Fighter shown here is typical. This machine is probably C4879, belonging to a Wing Examining Officer who travelled around the Salisbury Plain district.The “toothed bird's head" cowling markings foreshadowed the many similar designs which appeared in later years. 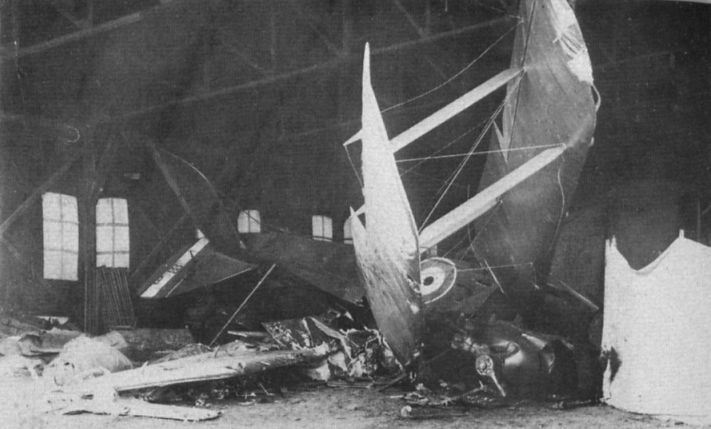 Avro 504A or B970 was built by Avro at Manchester, and is seen after an accident which left the fuselage facing in the opposite direction to the wings, having folded beneath them. This aircraft is recorded as being at the Central Flying School, Netheraon, on October 20, 1917. A Sopwith Pup in the “B" serial range. The white diamond on the fuselage aft of the roundel is a training squadron marking, but the usual Pup armament, a Vickers gun, is visible forward of the cockpit. The lower portion of the cowling for the 80 h.p. Le Rhone rotary engine is cut away to improve cooling. 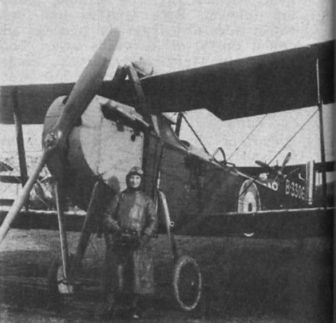 An unarmed Sopwith Pup with “C” serial prefix and a black diamond outline visible beneath its starboard lower wing, once again the marking of training squadron. Unlike the other Pup on these pages, this example has a complete circular cowling with cooling louvres cut into it. Morane BB biplane A287 gets a thorough going over by curious RFC personnel. 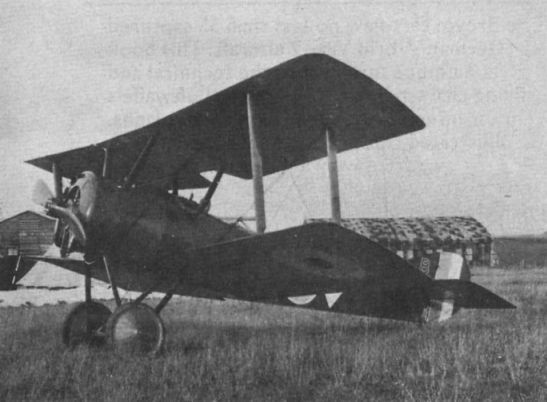 This machine was one of a batch of 200 assorted French aircraft purchased by General Headquarters, RFC, British Expeditionary Force in France. The BB had an 80 h.p. Le Rhone rotary engine, and the basic fuselage frame of one of these aircraft can be seen in the RAF Museum, Hendon.